ON February 14, Valentine’s Day, the happiest girl in town was probably Cecile Ang, not because she had a special someone, but as owner of the Royce’ Chocolates brand locally, almost all the chillers in all of her stores were empty before that day was over. It just shows that Filipinos are die-hard romantics, and Royce’ is really one helluva popular chocolate brand over here. Well, I must confess it is one of my favorite chocolate brands, as well. (The other one being Godiva’s dark chocolates. Mmmm.) I have probably gone through several boxes of Royce’ Nama Champagne, its bitter dark chocolates and the orange truffles. I even “steal” a couple of squares from my friend Ms. RP’s fridge whenever I pop over for a visit. The first time I “met” Cecile was through a phone call years ago. She politely texted asking if I was free to take her call, and after I did tell her she could, she called me to ask my help in editing a lifestyle magazine/newsletter she wanted to put out for free. I really didn't know who she was, but as I grilled her on the publication and why she wanted to put it out, and if she had enough funds to keep it afloat, it was only then that it dawned on me, as she humbly answered my barrage of questions, that she was the daughter of business tycoon Ramon Ang. While I did turn down her offer to edit the magazine, I could tell she was a dreamer and had a lot of guts. I mean, who in her right mind would put out a free publication just because she wanted to write about food and lifestyle? But she sounded so positive about the whole idea, I wished her well. Gads, I wish I could be as positive as she was about the publishing industry. 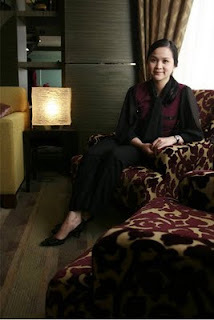 When I finally met her in the flesh recently, she had already been running Diamond Hotel, a property her father acquired in 2005, just as Cecile had graduated from the Ateneo de Manila University with a degree in European Studies. I was so surprised how young she looked! The Filipino expression “pinabili lang ng suka” came to mind. With her hair tied in a neat ponytail, her slight frame and her face sans makeup, she could certainly pass for a teenager. But there she was, at the helm of a five-star hotel. She describes her first year in the hotel as “very colorful.” As it was her first job straight out of college, of course her father took care to make sure she was well prepared to take on the duties as a hotelier. Cecile spent a year training by going around the different departments and learning about the functions of each hotel employee, from the concierge to the food servers, from the chefs and their cook helpers to the general manager’s secretary. Now president of Diamond Hotel, she is in charge of setting the direction for hotel policy, and overseeing the renovations and expansions of the establishment. “In a hotel you encounter all sorts of guests and colleagues that there was never a dull moment. Every day was a fun learning experience,” she says about her first year. Cecile says her father, whose sheer business acumen has made it possible for San Miguel Corp. to expand beyond the food-and-beverage business, has never given her nor her siblings “formal pointers” on how to manage a business enterprise. “But I think he leads us by example. My dad works 24/7 and is incredibly generous and friendly to everyone. I see how much he values everyone around him and it has taught us, his kids, to try and give back as much as we can to everyone around us as well. And, of course, slacking off is not an option.” Typically Chinese, each one of her seven siblings, down to the youngest at eight years old, have had to work during their summer vacations. Asked if she still has plans beyond managing the hotel, Cecile says she still “[likes] the business.” But most definitely she has started to stretch her own wings by going into other industries. She started on this path in 2009 when she successfully bagged the right to bring in Royce’ to Manila. I ask her if ever we would get to taste the incredibly delicious ice creams of Royce’, and she says: “We are planning to open a bigger shop that will have Royce’ ice cream and chocolate drinks and baked goods. We are just looking for an available space.” Whooopee! A chip off the old block maybe, but Cecile’s moves are definitely all her own. Cecile Ang is one of the most humble and down to earth person I have ever met in my lifetime. I got to know her wayback 2005 in Diamond hotel where she volunteered herself to work in the pastry kitchen of the hotel. I was a practicumer that time and we where both assigned to work together. She would roll and twist enseymadas, frost cakes and assist in transporting the pastry trolley to the Palm Court Buffet. No on would ever imagine that she was at that groomed to be the president of the hotel. The reason why she volunteered to stay in the pastry kitchen was because of he love and passion for desserts. She is addicted to koreanovelas as we both would talk endlessly about all the koreanovelas we know. At that time, she was already a big fan of Royce Chocolates as she would tell as that she would even fly these chocolates chilled via their private plane all the way from Japan. Cecile would mingle with all the staff from the stewards, laundryman to even us practicumers. We would both have lunch together at the coffee shop and people would be surprised that I who happen to be a nobody is dining with the president eating fried tilapia and laing. After my praticum, I never saw Ms Cecile again, not until 3 years ago when I visited Diamond hotel to assist my students in their application for practicum in the hotel's HR department. I was sitting outside the HR Office and saw Ms Cecile pass my way. I greeted her good morning and he just replied with a smile, so I thought maybe she didn't recognize me anymore. But, as she passed by my way again for the second time, she stopped for a moment and looked at me, then memories started to flashback maybe as she screamed and said that she haven't seen me in ages we had a small chat and she left. That moment on, I knew that Ms Cecile is really a great person. Her humility and goodness is so admirable that I hope most rich and influential people possess. Glad that even though I'm now in Abu Dhabi we are still good facebook friends! Thank you for your feedback qtec. I'm sure my readers appreciate your own insight into Cecile's personality. Good luck in Abu Dhabi.